PARIS (Reuters) - French President Emmanuel Macron has set his sights on the green vote in May's European elections, aiming to tap into deepening environmental concerns to build as broad a coalition as possible in the EU parliament and increase his party's influence. On Wednesday, the French leader's party announced its list of candidates for the May 26 vote, surprising rivals with the presence of a long-time member of the Green party, Pascal Canfin, in second place. 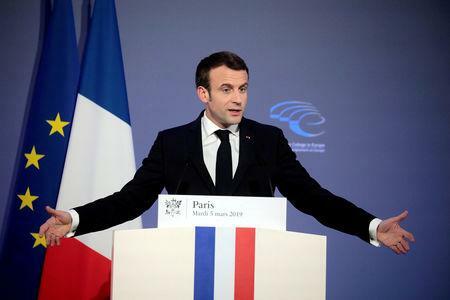 It was a signal that Macron hopes to capitalise on the renewed surge in environmental activism, especially among the young, evidenced by the success of Swedish schoolgirl Greta Thunberg's "school strike for climate". After the electoral successes of Green parties in Bavaria, Luxembourg and Belgium in recent months, Macron is keen to ensure France's greens, who usually do better in European elections than national ones, don't steal a march on his party. But beyond the purely domestic appeal to environmentally conscious voters, the 41-year-old president is also betting that green names on his list will convince other Green parties in Europe to join a future coalition in Strasbourg. That coalition -- which Macron aims to build with like-minded centrist or "progressive" parties -- will be critical in determining whether Macron gains influence in Brussels and ends up at the forefront of shaping legislation and filing key jobs, such as the next European Commission president. Canfin, a former European lawmaker and minister for development who headed conservation group WWF's French operation until he was poached by Macron, did not waste time spelling out the goal he has been tasked with. "We'll champion a coalition deal and clearly we'll offer the European Greens the opportunity to join," he told French radio this week. Macron has confused many in Brussels with his reluctance to agree to join the liberal-centrist family in the European parliament, known as ALDE, which would seem his natural home. Partly that is because the word "liberal" in France has long held negative associations with Anglo Saxon-style free market economics, which French officials have mentioned as a branding problem. But the main reason is Macron's desire to build a broader church, one that, as well as the Greens, might pull in centrist MEPs from the two main groups, the centre-right EPP and the centre-left S&D. Such a coalition, in which Macron's potential 20-24 MEPs would likely be the biggest contingent, could put the French leader in the position of kingmaker, since polls show the EPP and the Socialists are both unlikely to win a majority. The biggest prize Macron is hoping to win is Germany's Greens. Because of the size of the German contingent - the Gruenen currently have 13 MEPs but are likely to increase that number in the election - that could help Macron beef up the ranks of his 'progressive' grouping. Macron's campaign director, Stéphane Séjourné, named the German Greens in an interview with Reuters last October as one of the parties he was hoping to partner with. Macron's call to "make our planet great again" in 2017, and his self-endorsed role as defender of the Paris climate accord, have burnished his green credentials, Séjourné said. "We've put a lot of political capital into European climate diplomacy," he told Reuters. "This is how we're identified abroad, the president is identified as a climate leader." Séjourné said Germany's Greens, who are accustomed to the demands of coalition compromises, would be a better fit for Macron's En Marche than France's Greens, who are to the left. But it remains to be seen whether the Gruenen would shake hands with Macron, whose high-profile environment minister quit on him last August, criticising the former investment banker's pro-nuclear policies in particular. In a party that was founded on anti-nuclearism, some German Greens openly express scepticism about the sincerity of Macron's environmental outreach. Reinhard Buetikofer, a Gruene European lawmaker and co-chair of the European Green Party, tweeted that Macron was giving his En Marche party an environmental makeover out of simple fear of losing votes to the French Greens. But a source in the party says the German Greens are divided over Macron. "There are ones that put his pro-Europeanism first and his slight greenness second and therefore are favourable to collaboration with him," the source said. "On the other side there are people who see his right-wing economic policies and see him getting cozy with the Greens as 'greenwashing' and they don't really believe it." Jon Worth, a German green party member and EU blogger, says the fact party members shape what the party does makes it unlikely they would agree to join Macron's ranks, especially considering the profile of candidates put forward this time. "Many of them are quite independent-minded, quite left-wing people," he said. "I can't see many Macron-favourable people there on the list."